RapReviews.com Feature for November 27, 2007 - K-Rino's "Book Number 7"
Non-fiction books aren't the most popular thing in the world. Even when "must reads" come along, people are more likely to pick them up because they are trendy rather then because it truly entertains them. The real money is in fiction. But not just any fiction is suitable. If you want to really rake in the dough you have to serve up a juicy plate of scandal and intrigue and you have to find a way to turn into a series. It doesn't matter whether your books are well written as long as they entertain. So while non-fiction books are more likely to enrich your life with useful information, they tend to be too dense for you to read them too often. Fiction on the other hand lets you escape and allows you to think as much or as little as you wish. The rap game can often reflect this dichotomy. On the one hand you have acts that probably won't impact your life, but are packaged in a way that makes them damn entertaining. On the other hand you have rappers who might change your life or at the very least will give your mind and thesaurus a work out, but many times they can be too dense for every day listening. K-Rino is such a rapper whose work would be considered "non-fiction." The man has been dropping heavy lyrical content for well over two decades but has never hit the mainstream. The reason is that his product is one that doesn't appeal to the average fan for everyday listening. His beats tend to be laid back and dark, his lyrics are complex, and his topic matter is socially conscious. The good thing for rappers like K-Rino is that just like non-fiction books, they don't need to make the bestsellers list to be successful. K-Rino is well aware of this fact and his latest, "Book Number 7," is vintage work that will surely satisfy his longtime fans. Hit your car simultaneously, words slapping the driver and the passenger"
The path of the science and math was crafted in stone"
And K-Rino outdoes himself on "Line for Line:"
Taking you out with ten strips of duct tape on my mouth"
But no diss, you step out of line and we drop you"
K-Rino actually doesn't sound out of place on the track and rubs off on Chalie Boy as he steps up his verses. K-Rino also doesn't mind getting conceptual on a few tracks. The intro sets up the album nicely as the premise is archeologists finding one of K-Rino's rhyme books in the future and awakening his spirit. On "Amnesia" K-Rino takes on the role of a victim of amnesia and throws some twists and turns into the mix. The last track to note is the thirteen minute posse cute, "Multiple Choice Murders," where over 20 members of his South Park Coalition join him. K-Rino comes highly recommended. 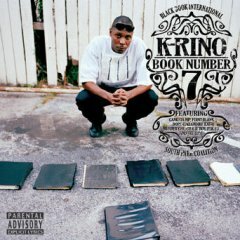 On "Book Number 7" we get the same high quality lyricism K-Rino always brings and some pretty good beats. Instead of producing most of the music, K-Rino gets beats from plenty of different people, helping eliminate filler tracks with boring beats. Production has been one of K-Rino's weaknesses in the past, but I must say on this album it is not problem. Of course, as solid as the production is, the album as a whole lacks certain things. You won't find any danceable music on here or even anything remotely catchy or uplifting. I don't think K-Rino needs any of that on his albums, but if you want pop or radio oriented rap this isn't the place to get it. If you don't mind getting your catchy music elsewhere, "Book Number 7" provides plenty of deep and thought provoking music to stimulate your brain.